LXS196 is a potent, selective and orally active protein kinase C (PKC) inhibitor, with IC50 values of 1.9 nM, 0.4 nM and 3.1 μM for PKCα, PKCθ and GSK3β, respectively. It can be used for the treatment of uveal melanoma. MDK-8650 is a selective PKC-θinhibitor, with an IC50 of 12 nM. SRI-011381 hydrochloride is a TGF-beta signaling agonist. 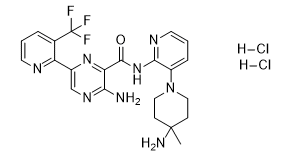 SRI-011381 is an agonist of the TGF-beta signaling pathway for treatment of Alzheimer's disease. BLU-782 (BLU782) is a novel potent, selective inhibitor of Activin receptor-like kinase (ALK2) mutant R206H with binding IC50 of <10 nM. Halofuginone Hydrobromide is a potent prolyl-tRNA synthetase inhibitor. SM16 is a ALK5/ALK4 kinase inhibitor with Kis of 10 and 1.5 nM, respectively. BIO-013077-01 is a novel potent antagonist of the TGFbeta family type I receptors, Alk5 and/or Alk4. PKC-IN-1 has been found to be a PKCβII inhibitor that probably has biological activity in antineoplastic studies.